Look, I’m really sorry about this, and I wish I could promise it won’t happen again. Problem is, I’m sure it will. It’s all rather embarrassing, but we’ve got a mix-up with the names again. I at least take some comfort in the fact that I’m not the only one to get confused, that even the taxonomists are at a loss. They agree that we are talking about plants from the Brassicaceae family, but it’s when we get down to the genus level that they seem to lose the plot. So, while white mustard is Sinapis alba, black mustard is Brassica nigra, meaning that mustard plants actually span two genera, namely Sinapis and Brassica. Yes, sounds strange to me, too. Either way, they are all from the same family as radish, turnip, broccoli, kohlrabi, cauliflower and cabbage. And it is this cabbage link (cabbage is cavolo in Italian) that explains one of the names (because, surprise, surprise, there are many) for mustard greens in Sicilian, cavuliceddi. 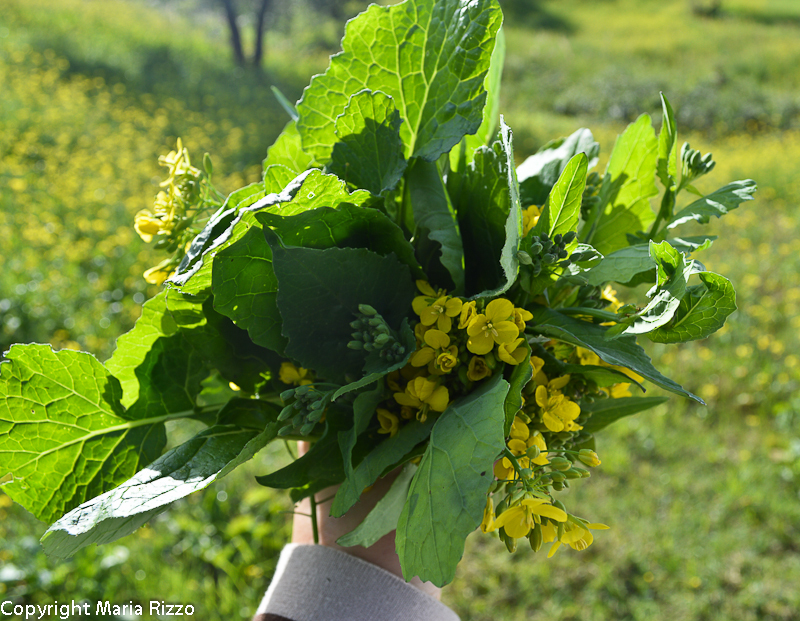 The seeds of these plants are of course used to make mustard, with the specific type varying according to the species (yellow mustard, for example, comes from Sinapis hirta). 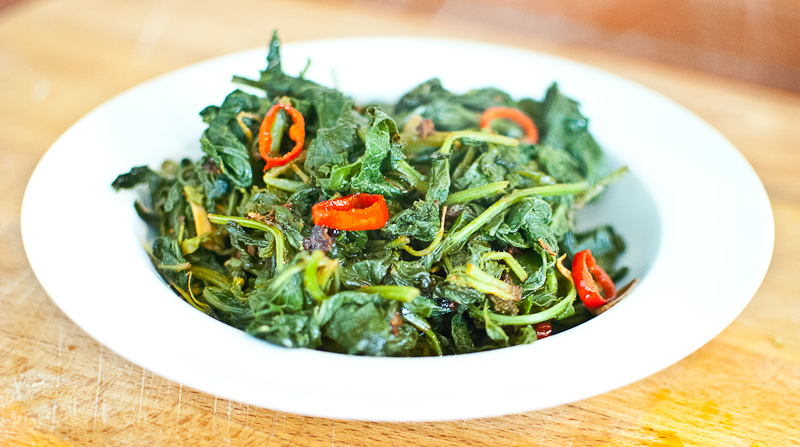 So, for those of a fiery temperament, we have mustard greens stir-fried with garlic and chilli, and for those looking for something more soothing, eggs and mustard greens, and mustard green frittata. These two approaches – eggy or eggless –, although both extremely limited in terms of ingredients, are opposites – one threatening, pugnacious and intense; the other, delicate, creamy and comforting, with just a faint bitter aftertaste. In the former, the hot, mustardy kick we associate with other members of the family, such as horseradish and watercress, comes through; in the latter, that same kick is delivered by a padded, velvet boot. By the way, the following cooking methods also work well with other leafy greens, such as chicory, spinach or turnip tops. 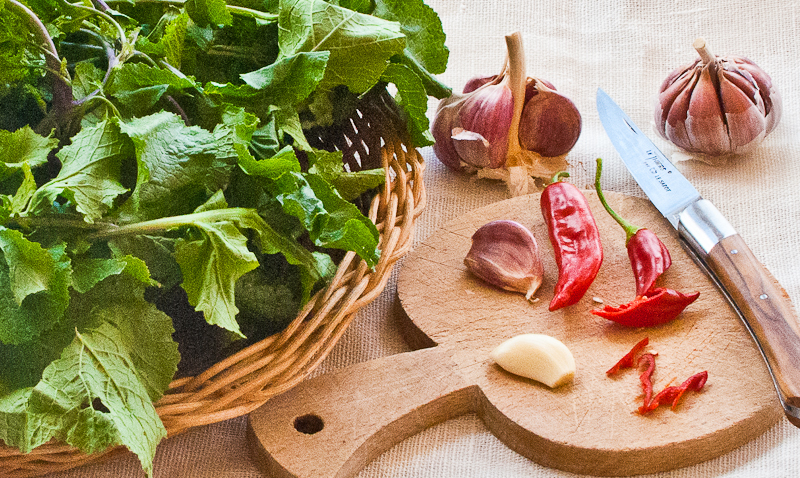 You will see from the photos that the garlic and chilli version is done with the leaves of the plant. This is because I had had to rely on my greengrocer for the raw materials. 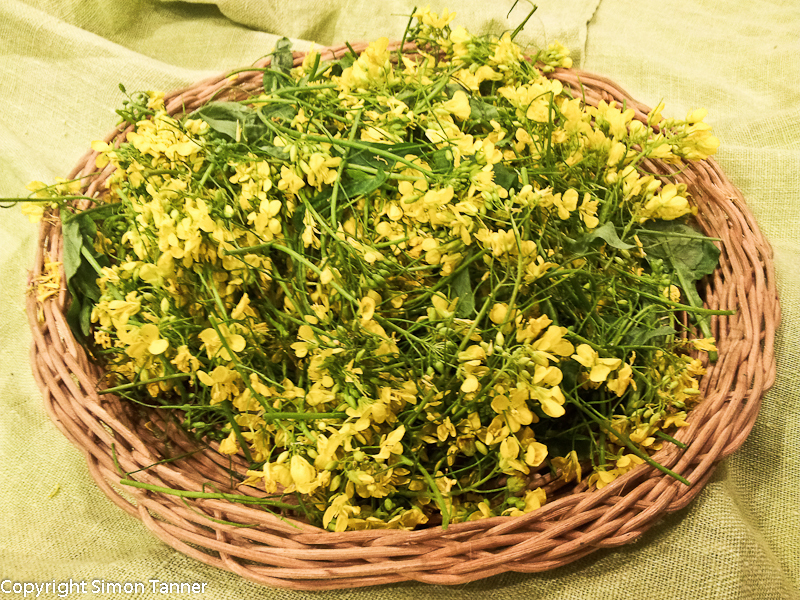 The egg-based recipes, meanwhile, were produced after a morning in Maria’s mustard meadow, picking flowers and watching Maria run away from hornets, and use only the tender tops, but all the recipes work for both parts of the plant. Wash the leaves and/or flowers and then transfer to a large frying pan. You will probably need to cook a couple of batches. If you are using the larger leaves, add a little water (but no more than half a glass), while if you are cooking the tender plant tips and flowers, do not add any water (the water left on the flowers after washing is enough). Dry-fry over a medium-high heat, until the greens have not only wilted and lost any excess water, but begin to catch on the pan and brown. “they must be abbrustoliti”, toasted, Maria was at pains to stress. Mustard greens that are not duly abbrustoliti are fit only for the bin as far as she’s concerned. And I daren’t argue with her. Heat 2 tablespoons of olive oil in a large frying pan, then add 2 sliced cloves of garlic and a sliced red chilli pepper and gently fry for a minute. Turn the heat up to maximum and add the greens. Stir fry for a couple of minutes until the greens are well coated in the chilli-garlic oil and leave no residual water in the pan. Season to taste. These are great with sausages, but also as a side dish for quiches or cheese dishes. Or just cheese on its own, for that matter. You can, and this is Maria’s favourite version, simply sauté the prepared greens in a little oil and season well, then serve with a fried or poached egg on top. Or you can go the scrambled route: beat 4 eggs together with 2 tablespoons of grated parmesan (the cheese is optional, but works), and season well with salt and pepper. Heat 2 tablespoons of olive oil in a large frying pan and add the greens. Stir-fry for a couple of minutes over a high heat. Then turn the flame very low (or even off) and add the eggs, stirring until they are lightly scrambled and just set. Serve. The greens in the photo sadly failed to meet Maria’s exacting standards in terms of toastiness, although she conceded that they were “acceptable”. But that was good enough for me – when a Sicilian tells you that what you’ve produced is acceptable, you know that your first Michelin star is just round the corner. 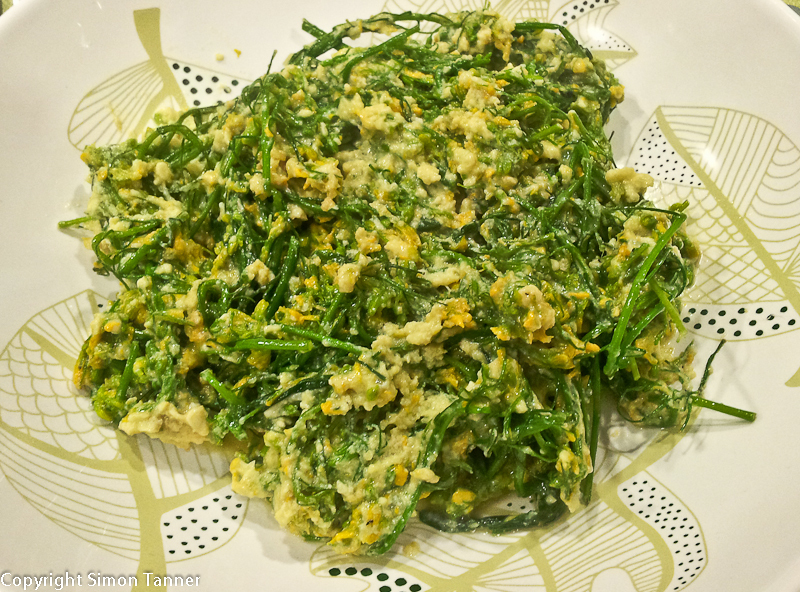 Roughly chop the greens and mix together with 4 beaten eggs. Season well with salt and pepper. Heat 2 tablespoons of olive oil in a large frying pan over a high heat and add the eggy mixture. After a minute or so, lower the heat. When the underside has browned, place a large plate over the frying pan and flip the frittata onto the plate, then slide the frittata back into the pan to finish cooking the other side. Can be served warm or cold. This entry was posted in Ingredients, Vegetables & side dishes and tagged chilli, eggs, mustard greens, vegetable by hungryenglishman. Bookmark the permalink. What’s taxonomy? Is that an english word? Doesnt it mean stuffing animals. I am an animal but im not mad about mustard. Just mad…..